OSWEGO, NY – The north end of East Fourth Street is steeped in history. The area is home to Fort Ontario and the Safe Haven Museum. On Tuesday afternoon, some new history was added to the mix. 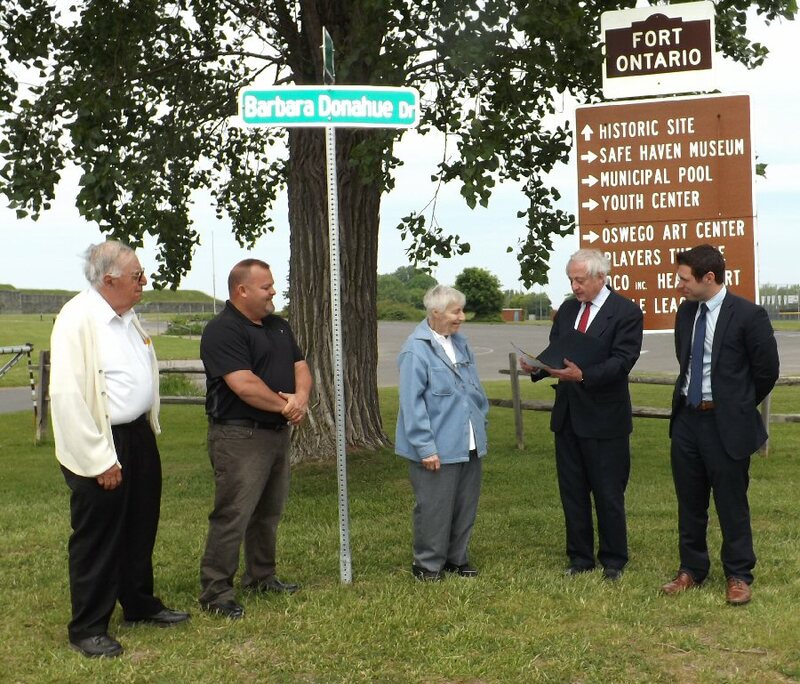 In a brief ceremony, witnessed by nearly two dozen people, Oswego Mayor Tom Gillen officially dedicated the stretch of roadway as Barbara Donahue Drive. 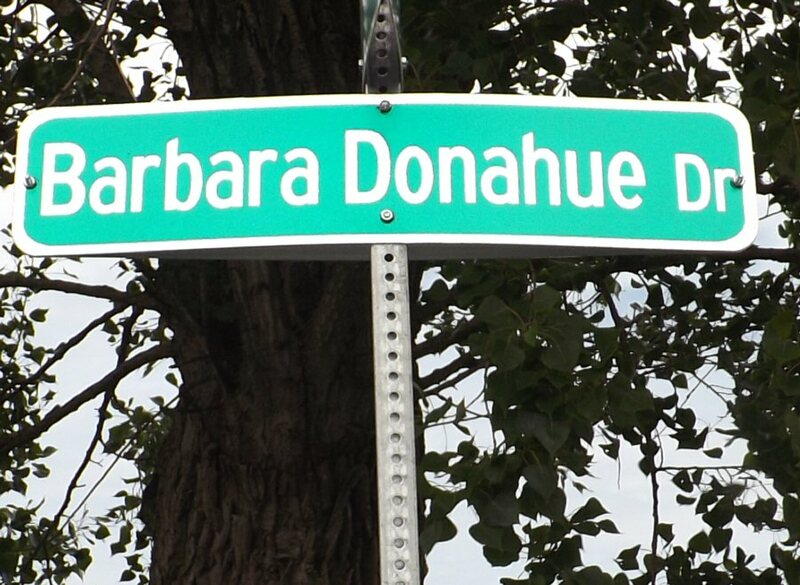 Barbara Donahue Drive was dedicated in Tuesday afternoon. From left are Tony Leotta, Mike Myers, Donahue, Tom Gillen and Bill Barlow. The dedication is in recognition of Donahue’s decades of service to the Port City. Donahue began working for the city on July 8, 1983, as a laborer in the Department of Public Works; she also served the city as a sign maintenance worker and traffic violations clerk until her retirement on Oct. 6, 1998, the mayor said. She was elected to the Common Council and served as a representative of the Second Ward for four terms (Jan. 1, 2000, until Dec. 31, 2007). While waiting for the ceremony to begin, Donahue shared some memories of the area with friends and family members. The officers’ quarters were here and the enlisted men’s barracks were over there, she pointed out. “And, down below there is where the refugees were housed,” she said referring to the near 1,000 people who escaped World War II and invited to come to Oswego. On Aug. 5, 1944, 982 refugees who survived Nazi reign during World War II arrived at Fort Ontario in Oswego. They were allowed into the country as “guests” of President Franklin D. Roosevelt. Donahue said she also remembers her father running on the track nearby the barracks. Current Second Ward Councilor, Mike Myers, had high praise for his predecessor. “She really did a lot to help out the people of this ward, and all the residents of the city. Barb got the bad curve taken out of Fourth Street right here and straightened it out making it much safer for motorists and pedestrians going to the fort, Art Association are to see a show at the Players’ theater,” he said pointing to the yellow double line street markings (remnants of the large curve) in what is now a parking area. Donahue’s service to the city has run the full gamut, Leotta noted. She has gone from laborer to legislator and done a lot in between, he said. The honor was well-deserved, the mayor said.